Whether you are a student, a teacher, an amateur or professional player, or even a collector, Poole Violins will help you find what you are looking for. You may want to buy or sell an old or new instrument, or have one that needs attention, perhaps having suffered damage or simply requiring a tonal adjustment to bring out its best. A customer wanting to buy a violin, viola or ‘cello may find what they are looking for in one of Mark's own new instruments, or in one of our stock instruments. However, if they do not, through our extensive contacts in the trade we are able to supply almost any quality of instrument from a better student violin to the finest instruments and bows. There are many accomplished violin makers around today keeping the centuries old tradition alive. Their work can represent great value for money, often enabling the player to aquire an instrument of similar, possibly even better tonal quality than a fine, older example but for a fraction of the cost. 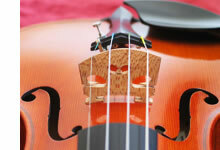 Poole violins therefore does it's best to have instruments by other modern makers available to be tried at all times. 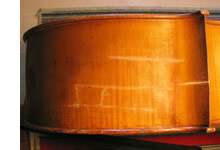 Owners wanting to sell badly damaged or neglected instruments sometimes have trouble finding a buyer. If you are put off by the costs of extensive repairs to make your instrument suitable for sale, don’t be! We are always looking for projects for restoration and try to offer the best possible prices.